The shifting sands, the mouth of stone, the claustrophobia, the river of blood, the massive man-eating worm, the earthquake . . . damn! 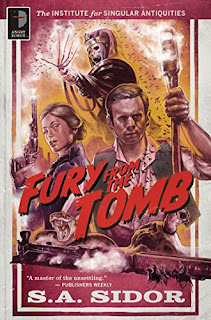 The opening 50 pages of Fury From the Tomb: The Institute for Singular Antiquities was some of the most exciting stuff I've read in ages. It's just a shame SA Sidor had to go and shift genres, and an even bigger shame he didn't pick a more engaging narrator. Romulous Hardy (Rom) is a young Egyptologist, in over his head on his first dig and constantly playing catch-up with the figures around him. He narrates the story from decades after the fact, so that immediately removes some of the tension, and he tends to wallow in deep thoughts and philosophical musings, which often drags the story to a halt. It is entirely fitting for the pulp Victorian adventure genre, but it still makes for a difficult read. Unfortunately, the most interesting secondary character dies before the book hits 100 pages, and the characters who join Rom later (especially Evangeline) are simply not strong enough to carry a story. Maybe it's just hard to capture their personality through Rom's narration, but that excuse doesn't help the story. The other problem for me was that this epic, pulp adventure tale of hidden tombs and mummies suddenly shifts genres into a violent western, complete with bandits, cowboys, and a great train robbery, and that's not the story I wanted to read. I got bored, plain and simple. I started skimming passages, then pages, and finally chapters, hoping for another shift in a better direction, but it was not to be. There is a sequel on the way, The Beast of Nightfall Lodge, but being that it's another story of Rom and Evangeline, I doubt I'll be giving it a read.